Lucy is a Diclonius girl around eighteen years old. She has developed strong emotions of hatred and vengeance towards regular humans mainly because of how she was treated by the majority of them as a child, making fun of her horns and giving her insulting nicknames such as freak. As a child, she bonded with a dog that was killed right in front of her by classmates, triggering her first killings. She loses all sense of empathy, killing without much concern, and acts somewhat sadistic, often torturing victims before killing them (such as Bandou and Nana, though she failed in killing them both). Towards the end of the series, however, she begins to show remorse for her actions, mainly towards Kohta, who lost his father and sister to her. Kohta was Lucy's childhood friend, though she didn't trust him when they first met. 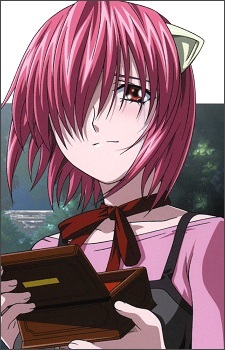 As they became friends, Lucy starts to have feelings towards him. She kills Kohta's father and sister out of jealousy when Kohta goes to a festival with his cousin Yuka, which causes Kohta immense mental trauma that makes him forget about her and his cousin. At the end of the manga it is revealed that her real name is Kaede. Coincidentally Kaede was also the name of the inn Kohta lived in, "Kaede/Maple Inn"
She is aware of her "Nyu" state as revealed in the manga by her worries just before she reverts. "Lucy" is not actually her real name, but the name of her inner Diclonius killing instinct that wants to exterminate mankind, her real name is "Kaede". Not seen in the anime, she has a third personality that is just her diclonius killing instincts. This personality is extremely sadistic and destructive, even more so than Lucy her self. The closest to this third persona in the anime is Lucy's internal hallucination in the anime. This was her killing instinct taking over her in a physical, manifested form.